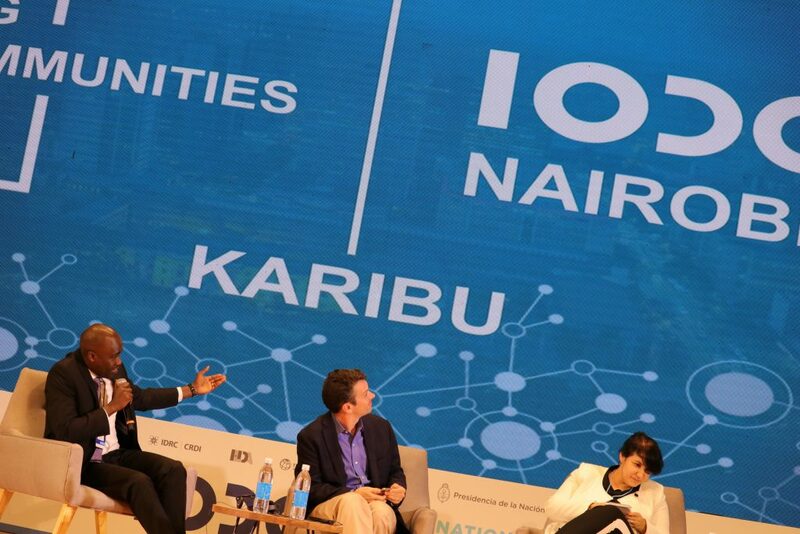 IODC 2018 closing panel where the announcement about Kenya hosting the next conference was made by Dr Korir Sing’oei, Head of Law and Policy in the Office of the Deputy President in the Republic of Kenya. The International Open Data Conference (IODC) 2018 came to a close on 29th September, 2018 in Buenos Aires, Argentina. More than 1,500 participants from 70 countries descended on the Usina del Arte, an early 20th-century electrical power plant-turned-arts venue whose auditoriums and gallery space were home to this year’s 2-day event. Among the participants were representatives from government, civil society and even private sector, converging in panels and workshops to explore how to move open data for development to the next level. While they represented different stakeholder groups, they also represented a myriad of data communities working along thematic areas and geographies. The Open Data in Sub Sahara Africa session which was hosted by the Africa Open Data Network provided an opportunity for some of these thematic interest groups to meet and discuss potential areas for collaboration and prioritization over the next couple of years. To set the stage a panel made up of representatives from the UN Economic Commission for Africa, the Web Foundation, AODN, the Government of Kenya, Hivos and the Africa Data Revolution Report provided a glimpse of some of what is already unfolding on the continent and what we can expect in the coming year. The participants then discussed in their thematic groups what they felt the policy, human capital and research gaps were in moving forward an evidence informed open data for development movement. In examining what the common challenges are across thematic issues and geographical areas when it comes to open data availability, access and use it becomes clear that there are some cross-cutting issues in which cross-community collaboration could bring real value. And this, evident from previous convenings, the work of the community over the last eight years and some of the conversations at IODC2018, provides inspiration for the IODC 2020 which will be held in Nairobi, Kenya. With the broad theme of Africa Bridging Data Communities, the next IODC is likely to be the largest platform ever for data communities to explore the evidence, share experiences and set the agenda for the following two years. The journey to IODC2020 will provide us with a pathway towards building the discourse and exploring what cross-community collaboration could look like. It will also provide us with an opportunity to bring to the space many of those who work on open data for development but do not usually have a strong presence at IODC such as the earth observation groups, the national statistics community, the research/academic data community and the technology/infrastructure players who provide the underlying platforms many in the global community rely on. While it is too early to say what the next IODC would look like, I can say this, it will be different and it will continue in the tradition of seeking to bring open data to bear on the development challenges we are grappling with in the global south; ending hunger, ending poverty and reducing inequality in all its forms everywhere. And I will be there. Next:We Have Superpowers! But They Need Data. Hope to attend this as I’m not far from Kenya.